So, there you all were, dutifully watching Acorn Electron World grow and suddenly, 1st January 2009 came and the whole web site layout changed, and more than two thirds of the content was removed! What happened?! Why did I do this to you?! And, more importantly, what does this mean for the Acorn Electron scene? Well, if you have been checking the site since its conception in 2001, you cannot have failed to notice the quite mammoth changes that have occured during the past eight years. 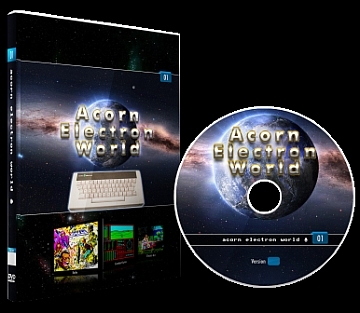 The site once held nothing except a picture of the Acorn Electron and a downloadable (eek!) Word document for you to fill in, in order to subscribe to the Electron User Group. By 1st January 2009, not only did it hold everything ever professionally released, but also many BBC public domain titles too. In fact, the site had grown to such proportions that there was literally nothing left to do. Every last bit of stuff I had which was in any way Elk-related had been made available. There were however still some gaping holes in the BBC and Acorn documentation catalogues. For years I had been hoping some kind soul would scan the old Acorn User, Micro User, Acorn Computing and A&B Computing magazines - and there had been a number of requests for them on the forums of Stairway To Hell - but, as in the death-knells of the old Electron User Group, few people responded by scanning their own copies of them. With some 200 pages to every issue, it was hardly surprising. A little before I took down a lot of the downloadable content, I started to become thoroughly fed up with the web site itself. I gazed around at all of the physical stuff I'd collected and it seemed to be saying "You've spent all this time and effort making sure anyone who uses the internet can find out everything about us, and for what? If the site disappeared tomorrow, nobody would care; in fact, nobody would even miss it!" I also started to feel quite resentful of the persons that did in fact, use the site. I thought, "Just creating a single one of these public domain compilations may take me a whole week! Yet no-one even bothers to download it and, if they do, they get all my work for free in less than a second!" To put it bluntly, I felt thoroughly unappreciated. A situation that was not helped by my personal life and job situation at the time, and the fact that no-one apart from Dave M had ever bought the Acorn Electron World DVD. As one of a number of changes I made this year, I decided to take down the free downloads on the site. I figured that very few people visited the site anyway and so it was unlikely that anyone had downloaded all of it. To get the downloads, these people, and anyone in the future with an interest in the Electron, could be asked to buy a DVD and, each time I got an order I would also make some improvements to the site. Therefore increasing my motivation and slowly keeping the site going, rather than suddenly bringing it to an end, as has happened to far too many other BBC/Electron sites. Now, doubtless, some of you reading this article will be doing so not because you are on the official AEW web site or because you supported me in my efforts but because you instead have downloaded a torrent of the DVD into which I have invested so much labour. Who knows? At some point, someone may simply rip off the DVD wholescale - including this article! - and post the whole thing up elsewhere on the internet! This is something I do not expect to control. Software piracy is as old as software itself - and the vast majority of professional releases on the DVD are copyright products. Only the site design itself is truly mine. All the other 'public domain' discs are, as their title suggests, freely distributable. To my surprise, I have now sold about forty DVDs of the site. As I expected, I feel a lot more motivated. People are visiting it, and they are impressed enough by what they see to order it. As a result I have begun to scan that large pile of Acorn User magazines - and produced several new discs so far this year. It would be nice to think that, if people do offer the discs I originally created on their own website, they will complement them with some original content of their own. However, I strongly suspect that they will not do so; because no-one will be as motivated as I am to actually do the work that needs doing - to continue archiving, scanning and programming to preserve this important piece of our computer heritage. I know that most people do not resent the fact that they need to pay for a DVD of the site now to get new content. My motivation to continue improving it as long as they do so now also means I am not particularly worried about the inevitable torrents of it that will spring up. After all, a torrent only preserves the site as of the date of the DVD. Whereas if you buy it directly, you always get everything, including changes made on the very day of your purchase. On the off-chance that there is another person as passionate about preserving the Elk's history as I am, I hope he does indeed set up a site very much like the 'old' AEW, do the work and keep it regularly updated with new content. I will be very happy to visit. To anyone who may think of torrenting a DVD they have purchased, I say please don't do it; I don't want to feel demotivated to continue again.